This urn with cover was probably made in France, Dieppe, in ca. 1700-50. 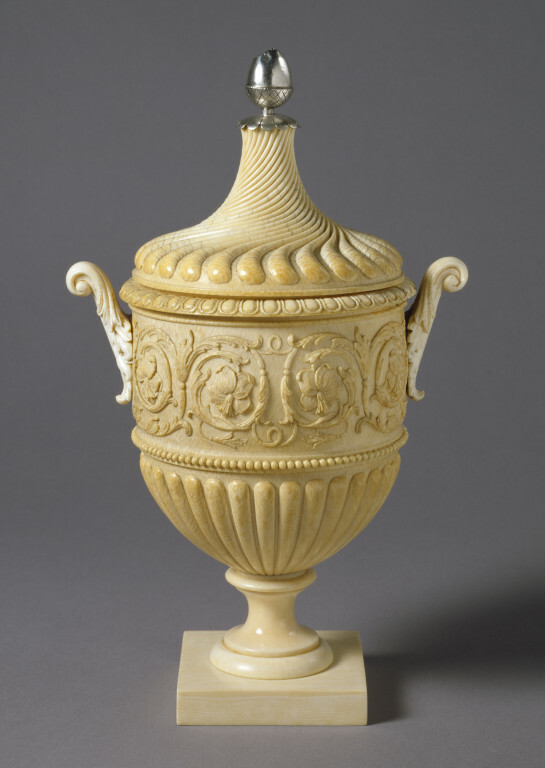 This urn is made in ivory with a silver finial, and the two handles is probably a later addition, as is the base. Both base and cover seem to have been made using a lathe initially (machine-marks are visible on the inside of the body and the cover), and then carved. This ivory urn is probably based on a print by Pietro Sante (Santi) Bartoli (1615-1700), first published in 1697 in P.S. Bartoli, Gli antichi sepolcri, overo mausolei romani..., pl. 100; see Oechslin 1982, cat. no. 74. Bartoli's engraving depicts a marble funerary urn from a grave outside the Porta Solaria, Rome. 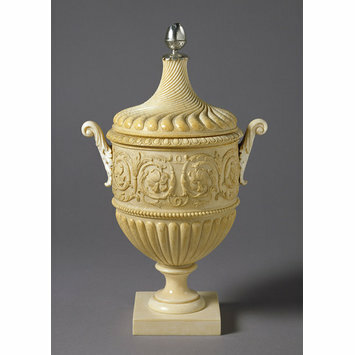 This ivory urn with a silver finial is in the style of an antique urn, with an integral cover and two handles. Round the body of the base is a scrolled band of stylised foliage in relief; the lower part tapers to the moulded scalloped foot. Stands on an integral rectangular base. The cover is carved with spiral gadrooned scallops, and is surmounted by a silver finial in the form of an acorn. Bequeathed by Henry Louis Florence Esq., formerly of 16 Royal Crescent, Bath, in 1916.